Proven to reduce stress and keep your pets happy! Our utility patent is written to capture all lightweight, portable applications. Tested to show an 85% increase in use by otherwise timid pets. The Risk-Free Ramp is a patented technology that adds adjustable, collapsible sides to make your pet feel safer and more willing to ascend ramps, staircases, and lifts. 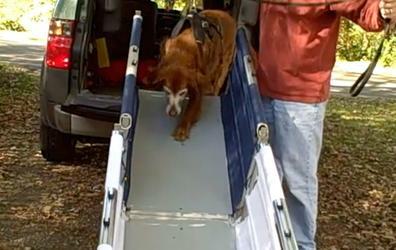 By simply incorporating vision-blocking sides into our ramp, we eliminate the primary reasons that dogs won't use ramps, as well as the dangers to your pets--especially when managing the elderly, disabled, and mobility-challenged. There's nothing like it on the market today, and it's the only ramp in existence that reduces apprehension in dogs while simultaneously encouraging them to use it. Learn more about the visual cliff, and how our product provides the safest and most reliable option for your pet. What is the Visual Cliff? A common, but largely unrecognized, phenomenon affecting the lives of countless pet dogs and their owners is the aversion to the perceived “visual cliff.” A behavior that can be reliably observed in puppies as young as 28 days old, it causes extreme avoidance behavior in dogs (as well as humans, cows and almost all other animals) when faced with a perceived risk of falling. In simple terms, most dogs are hard-wired to avoid differences in elevation - and the risks associated with falling off of them - at all costs. By simply incorporating vision blocking sides into our ramp, we eliminate these dangers, as well as what we consider to be the primary reason dogs won’t use ramps. There’s nothing like it on the market today, and it’s the only ramp in existence that reduces apprehension in dogs while simultaneously encouraging them to use it.